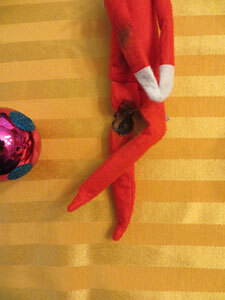 Christmas Carnage: How the “Elf on the Shelf” mistakenly got incinerated in my house. When we began our “Elf on the Shelf” holiday tradition, our hopes were high, and our anticipation for great memories was true and sincere. Stockings—bright eyed and the emblem of kindness—back in his glory days. Having seen hollier and jollier days, poor Stockings is worse for wear. Christmas burned bright for us this year. We had a house filled with love and friendship and great times. Sadly, Stockings’ burn was a literal one. His leg has nearly been severed. 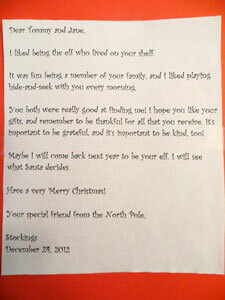 Before Stockings’ disappearance on Christmas morning, he left a note of encouragement to the kids. He also explained that his return isn’t guaranteed. Life can be dangerous in the North Pole . . . polar bear attack, perhaps? If Stockings doesn’t make a triumphant return, we have a backup candidate warming up in the elfin bullpen. The new year will see if Stockings comes back—battered but better than ever. Or, if we’ll pull a seasonal switcheroo. The 2012 Christmas holidays certainly burned bright in my house—just a little too bright, in fact. This past December—on December 23, to be exact—my husband accidentally set our “Elf on the Shelf” on fire. Yes, I know that is a horrible infraction, and, believe me, I have had nightmares about this impish incineration since it occurred. But the one good thing that came from this pixie pyromania is that I realized how important it is to keep these Yuletide traditions alive and how the roving elf might be designed for children, but we adults end up being charmed and captivated by it. 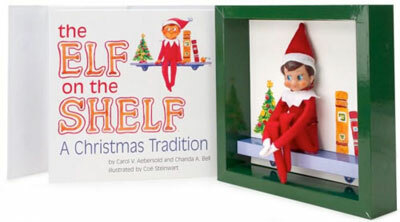 In case you’re not familiar with this festive franchise, the “Elf on the Shelf” is a plastic-head doll that comes clad in a felt-like bodysuit that is red and white. The gloves, collar and hat border are all snowy white; the full-length outfit and stocking cap are rosy red, like Santa’s cheeks and nose. The elf arrives at your house—via some swirling Christmas magic and a credit card swipe—and then he teleports around your home, always up on a shelf or on a ledge or on a light fixture so he can watch your family’s goings-on and then report back to the Big Guy in the North Pole. 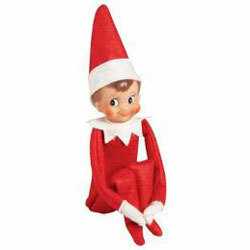 Of course, the elf’s interior flight is provided by a parent or parents. In our house, my husband shuffled Santa’s helper from here to there four times. I handled the merry movements on 20 occasions. 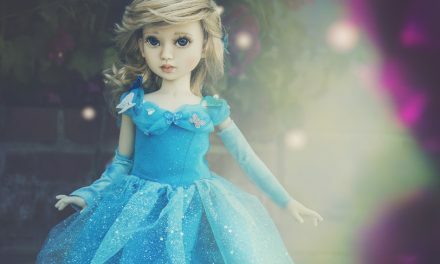 Suffice it to say, with my penchant for dolls and bears, and my soft spot for soft toys, I bonded with Stockings—that’s the name the kids and I chose to dub our elf. Stockings perched on top of our fridge—he liked the icy climes. He swung from our chandeliers; he peeked over our armoire’s edge; he hid behind our bookshelves’ clocks. 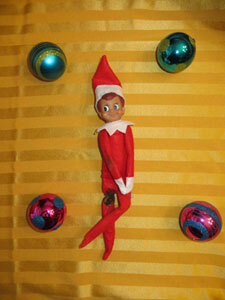 It was a brainteaser to come up with clever hiding spots for Stockings, and the kids LOVED finding him in the morning. It made me feel toasty warm and cozy inside to see how this little vinyl visitor could spread so much joy and excitement. Then came the fatal night. . . . It was nearing the end of Stockings’ stay with us. According to the myth that surrounds this merriment, Stockings departs before Christmas Day so that he can file his report on whether the household has been “naughty” or “nice.” (There’s a sort of KGB quality to the whole affair, if you really think about it: a stealthy fellow shows up one day, unannounced, hides and spies, and then he returns to a frozen wasteland to render his follow-up observations!) 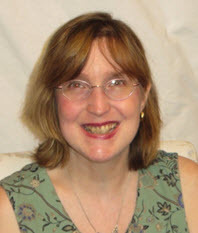 It was the early-morning hours of December 23 and I had been moving Stockings around since December 5. I was running out of original spots to position him, and then a spark of genius hit me. I placed him snugly inside a wall sconce and knew that he would be spotted, but it would take a few searches to discover him. His nestling inside the wall lamp worked beautifully, and the children were happy to find him once more. All was right in our little world. Later that night, after the kids were sound asleep, my husband and I sat down to do some heavy-duty wrapping for the children’s gifts and all our assorted friends and family members. It was late; it had been a long day; my husband forgot about our silent houseguest. Earlier in the evening, I had cautioned him NOT to turn on the wall sconce that I feared the intensity of the lightbulb could singe Stockings. Well, that concern was heeded five hours earlier, but was completely forgotten as we settled down with scissors, markers, ribbons and bows. He flicked on the lightswitch, rooted around in the junk drawer for Scotch tape, and then exited the kitchen. He left the wall sconce on, and poor Stockings’ goose was cooked. It’s a Christmas miracle that he didn’t sizzle into an anthill of candy-cane-colored ashes. Even more impressive, it’s a wonder that his baking was discovered by me before he set the house ablaze. I wandered into the kitchen right after my husband’s departure to see if we had some holiday stickers and I saw the flickering sconce, smelled the aroma of warmed wishes, and knew right away: Stockings was on fire. In a heartbeat, I pulled him off the sconce. He was hot to the touch. His hat, head, and upper torso looked fine. The damage was to his lower torso and legs. One limb was slightly singed; the other was decimated. I felt terrible—it was such an awful sight. Our little elf who had been designed to represent Christmas cheer was now a casualty of incandescent carnage. It was a low point for me. I couldn’t bear to tell the kids that Stockings was now potentially one-legged, so I carefully carried him to his next hiding spot. I opened a cabinet door and placed him behind some picture frames. His little smiling face and wide appealing eyes stared out at me. I wasn’t sure, but his usual optimistic look seemed blanker and darker. Rather than an encouraging expression, he appeared recriminating and yet resigned. My husband and I hadn’t killed Stockings, but we certainly had altered him . . . perhaps beyond repair. We got through the last finding of the Elf and then his disappearance on Christmas morning. 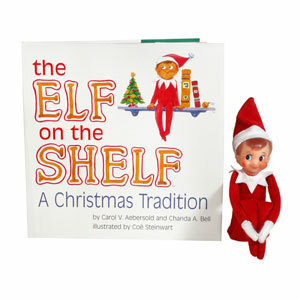 He left behind a hardcover picture book that explains the legend of the “Elf on the Shelf,” and I added a personal letter to my children at the book’s beginning. 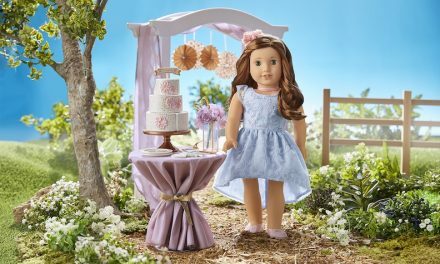 In this letter, Stockings offers words of wisdom and reminds them to be good for goodness’ sake—not for toys and material rewards. They should be grateful for their gifts and kind to all mankind. He also explains to them that he might not be returning next year—it’s up to Santa, who does the final assigning and travel itinerary. 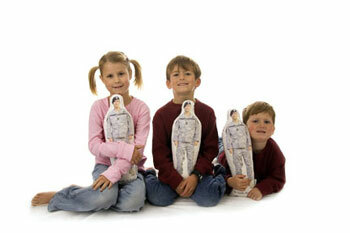 The kids were saddened to learn about this; they want Stockings to come back. I know where they’re coming from. I, too, wish he could arrive in our home as good as new. So, I am faced with a Christmas dilemma for 2013. I have Stockings, who did more and gave more of himself than any elf ought to. He nearly gave his life and limbs to be a part of our holiday tradition. How can I possibly abandon him now? I am figuring out a way to perhaps make a leg splint out of a Popsicle stick and then wrap it in colored paper or perhaps some radiant red fabric. The burn marks on his uniform would have to remain intact—a reddish brown badge of courage. In case his leg completely falls off before it can be restored, I’ve run out and purchased a backup elf. He was on sale after the holidays and I saved 45% off his retail price—not bad at all. However, he isn’t identical to Stockings. His hair is a shade darker. So, perhaps, Stockings’ coiff has become more autumn brown than summer auburn, or maybe it’s his fraternal twin brother who will be our 2013 elf buddy. I’m not certain which way I’ll go: trying to repair my imp’s injuries or slyly substituting a pixie proxy. I have a year to decide. But I do know one thing for sure: I can’t bring myself to toss Stockings out with the trash. He meant too much this past December and provided too many hours of joy. You can’t expect more than that from a toy or from an elf. So, Stockings, here’s my eulogy to you: Your time with us was a brief one, but it shone so brightly. It’s fitting that a light took you out. It scorched your legs and your costume, but it didn’t extinguish your spirit. Stockings, I shall never forget you! I hope in your plastic heart you can forgive me. 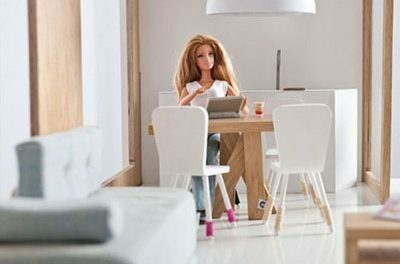 NextIkea Ideals: Like a well-loved dollhouse, there’s always room for dreams and desires.